Tucked away in charming Las Vegas Chinatown is a magical locale. Fairly hidden between a jewelry store and a Korean BBQ restaurant, the quaint little storefront is deceptively unobtrusive. But one step inside the heavy wooden doors leads you to a world of wonders. 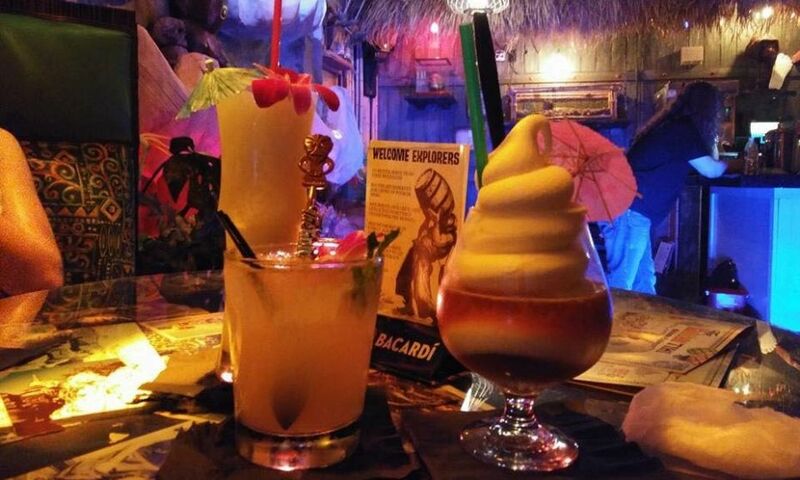 Welcome, explorers, to The Golden Tiki. Under a fiber-optic sky replete with shooting stars, a three-sided long bar serves visitors a vast array of specialty cocktails from a delightfully endearing line-up. Bamboo, palm fronds and trickling water enhance the Caribbean-inspired stylings. Behind a team of costumed bartenders, video loops from vintage films will make you feel like you’ve embarked on a three-hour tour of the islands. Explore a little further into the dimly lit corners, behind the giant seashell and beyond the cave-like private booths. There, you’ll discover a stunning collection of curiosities, memorabilia…and a cabinet filled with the shrunken heads of numerous Vegas celebrities. There’s never a cover charge at The Golden Tiki. Nightly live bands fill the air with frivolity like a Don Ho Tribute Happy Hour. Humorous themed events like Charlie Brown’s Thanksgiving Dinner have fans returning time after time. When did you first come up with the concept for Golden Tiki, and how long did it take from inspiration until opening day? One day in 1992, I stumbled upon a wonderful tiki paradise inside Islands Restaurant and Lounge at the old Hanalei Hotel in Mission Valley San Diego (now home to the yearly Tiki Oasis gathering). I immediately fell in love, and began to promote two weekly events under the name “Taboo” and my production company, Cocktail Nation. I had thousands of people each week, all dressed to the nines with aloha shirts, Fez hats, smoking jackets and cocktail dresses. The events, some of the first in America, were instant hits. One day, I’m called in for a meeting. I enter to the remnants of what was once paradise to find that all of the priceless artifacts were removed, the walls painted white, and the fish that had been there for forty years, were gone! My heart sank. Three years ago, I was approached by Jeff Fine, Joe Cain and Seth Schorr. They owned a bar that needed help. I wasn’t even thinking tiki. That part of my life died in the ‘90s. I (wanted) to call it Madame Wong’s, and make it a punk rock bar. Jeff said “How about tiki?” I thought it was a brilliant idea, but only if I could build it the right way. It needed to have multiple layers, and a strong backstory. I wanted an “adult Disneyland,” so I hired a team of hardworking tiki tradesmen, and we went to work nonstop. Sixty days later, we opened our doors to a packed house and a broken air conditioner. It was a success, but not without the blood, sweat and tears of many GMs, bartenders and servers who helped mold The Golden Tiki into what was recently awarded The Best Bar in all of Las Vegas. I owe all of them, and my patient, wonderful partners, a debt of gratitude. We’re celebrating our 3-year anniversary August 26th, but we really opened in June 2015. Once we opened, we’ve never closed. There are no locks on our doors. Have you always been a collector of the curiosities that you proudly display there? I have been. My love is collecting street art, outsider art. A few years ago I gave away over 100 pieces of art on the streets of Las Vegas in what was a citywide scavenger hunt. I’m also a huge record collector, but I mostly collect interesting people. I have the most awesome group of friends. Did you deliberately model the atmosphere and service to replicate “old Vegas”? Yes. I have been coming to Vegas since I was a kid in the ‘70s. I loved that era. My star-filled ceiling at The Golden Tiki was inspired by my love for Benihana, and their ceiling at the former Las Vegas Hilton (now Westgate Casino Resort). I moved here in 1999, and was saddened that so many icons were shutting down only to be replaced by soulless glass boxes that looked like airports. Our company’s goal is to open many themed environments that bring back the early Vegas visionary magic of Jay Sarno and Steve Wynn. Tell us about the specialty cocktails that make up your drink menu. We’re very proud to announce that we just brought on an award-winning USBG mixologist Adam Rains, who will be taking our cocktail program to the next level. We want to compete on the world stage. Adam is assembling a team to do just that. 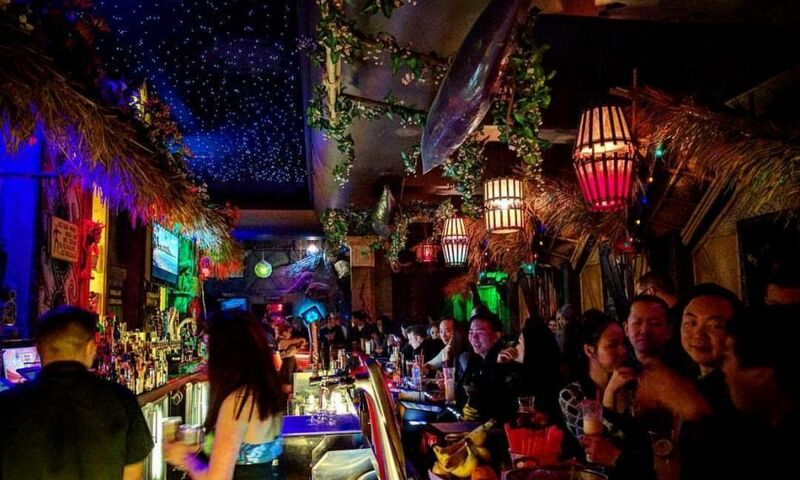 Do you have a personal favorite Tiki lounge, past or present? My heart will always be with the Islands Restaurant and Lounge. My giant clam waterfalls are an homage to that tiki bar. I honestly appreciate all tiki bars. I’m a lover of escapism. People try and pit Frankie’s Tiki Room against us, but honestly, I love them. We’re two different experiences. They call us Disneyland, and that’s okay by me. I think they’re small and dive-y, but that’s equally as awesome. Their drinks are great and people should definitely explore them. Why limit yourself or the good times and adventures you can have? 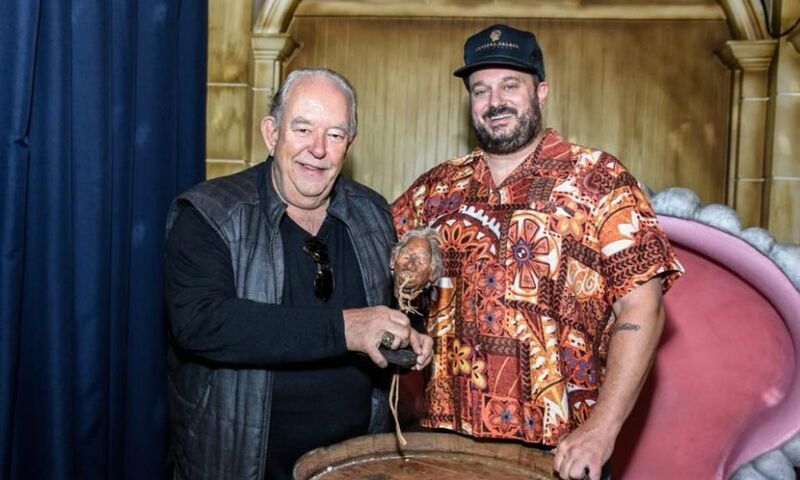 Who would be your dream celebrity to present with their own shrunken head? If I could present (a shrunken head to) anyone, alive or dead, it would have been Gonzo journalist Hunter S. Thompson or David Bowie. Sadly, most of my icons are dead. I would love for Elton John to come spin vinyl (he shops locally at Wax Trax records) and shrink his head. I’ve been blessed to have everyone I’ve asked agree to my crazy rendition of Grauman’s Chinese Theater. It’s been a blast, and they’ve all been great sports. The Golden Tiki is located at 3939 Spring Mountain Road in Chinatown. It never closes. For more information call, 702-222-3196. All photos courtesy of The Golden Tiki.